Looking for a hassle-free holiday in Fiji? To be transported straight to paradise minutes away from Nadi International Airport yet feeling like a world away from the troubles of everyday life? Denarau Island might just be your perfect Fiji getaway! Denarau Island is an island connected to the mainland but feels like a world of its own with five-star luxury resorts, a picturesque harbourside shopping and dining precinct at the Denarau Marina, its own Championship golf course, access to some of Fiji’s must-do activities and island excursions, and much more! It’s a place that you’ll only wish you had more time for when you consider all the 12 Amazing Things to Do in Denarau Island. So start planning your ultimate Denarau holiday with this list of stunning resorts in Denarau Island! While you’re here, you might be interested in the Complete Guide to Denarau Island, as well as our 11 Free & Cheap Things to Do in Denarau. Families, foodies and solo travellers alike have an array of things to look forward to at this beachfront resort on Denarau Island. 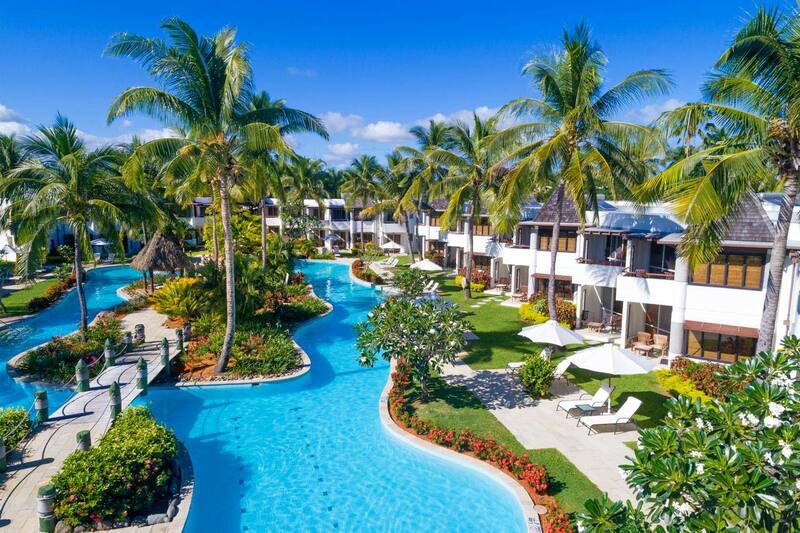 The Radisson Blu Fiji Resort boasts activities for every type of holidaymaker, without disturbing each other. Children will love the fun-filled Blu Banana Kids Club, while those here on business can make use of the free WiFi and gym facilities. As for those who want more “Fiji time“, unwind in the Harmony Retreat Day Spa or sip a cocktail by one of the four climate-controlled lagoon swimming pools. Escape to one of the tree-lined adults areas, indulge in a culinary experience at the four restaurants, and enjoy time together in your stylish and modern room, each with its own balcony or courtyard. Check Radisson Blu Fiji out! 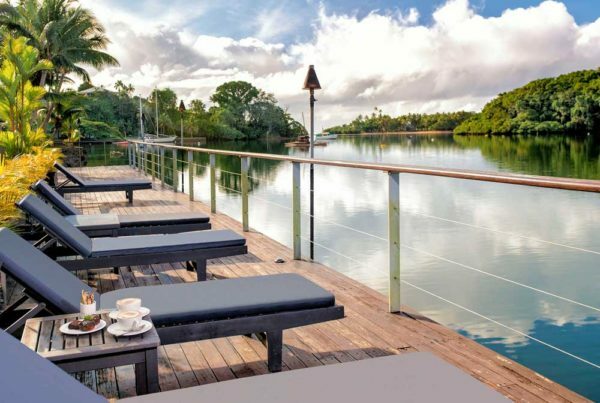 A spectacular option for couples, girlfriends’ getaways and solo travellers, The Westin Denarau Island Resort is a beautifully-designed resort with lots of exciting features to keep you busy (or ideally not-so-busy) while you’re here. 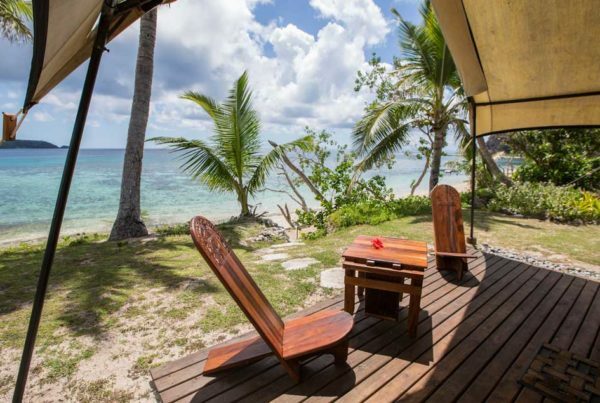 You’ll instantly feel the Fijian influence in the thatched-roofed bures, while having all the modern comforts like WiFi, fitness centre and a mix of motorised and non-motorised watersports. You’ll be able to make use of the facilities in the two Sherton resorts next door, as well as the 18-hole golf course just a quick stroll away. Don’t miss the Meke Lovo cultural shows every Wednesday and Saturday. This luxurious resort is well worth considering if wanting to treat the family or even for a romantic getaway. Embrace luxury at the adults-only Waitui Beach Club or pamper yourself at the So Spa. There are three eateries on-site or even room service if you would prefer a bit of privacy on your room’s private balcony. With a cute waterfront wedding chapel, it could even be your choice for the big day. Alternatively, families have the luxury of the kids’ club and fun pool features to keep everyone entertained. Check Sofitel Fiji Resort out! Enjoy luxury in a slightly different style of accommodation in your own self-contained apartment. The Palms Apartments is perfect for more independent travellers who want to make use of their surroundings, save some hard-earned money by making use of their private kitchen facilities (supermarkets are nearby in Denarau town), yet still have somewhere to retreat to. The Palms has its own swimming pool, cafe, fitness centre, baby-sitting and more. Check The Palms Apartments out! Beautifully furnished rooms with Fijian influence, you’ll have no doubt that you have arrived somewhere special at the Sheraton Fiji Resort. Situated next to The Westin Resort and Sheraton Denarau Villas, guests can make use of the 14 dining venues, six swimming pools, spa and fitness centres spread throughout the three resorts. Taste fresh Fijian seafood at the Flying Fish Restaurant or find something for even the pickiest eaters at the Feast Restaurant buffet. Enjoy live music at the Chime Lounge and just try to resist ending the night without boogieing on the dance floor! Check Sheraton Fiji Resort out! More modern luxury can be found at The Terraces Apartments. Just moments away from Denarau town with its shopping, restaurant and activity offerings, The Terraces provides all the conveniences for an independent holiday while having its own comforts too. Relax by the pool, dine at the on-site cafe, let the kids burn off some energy at the children’s pool or enjoy your own room service for those evenings where you’d rather not cook. Choose from one, two and three-bedroom apartments. Check The Terraces Apartments out! Families, large holiday groups and friends can enjoy their own private space at the Sheraton Denarau Villas. 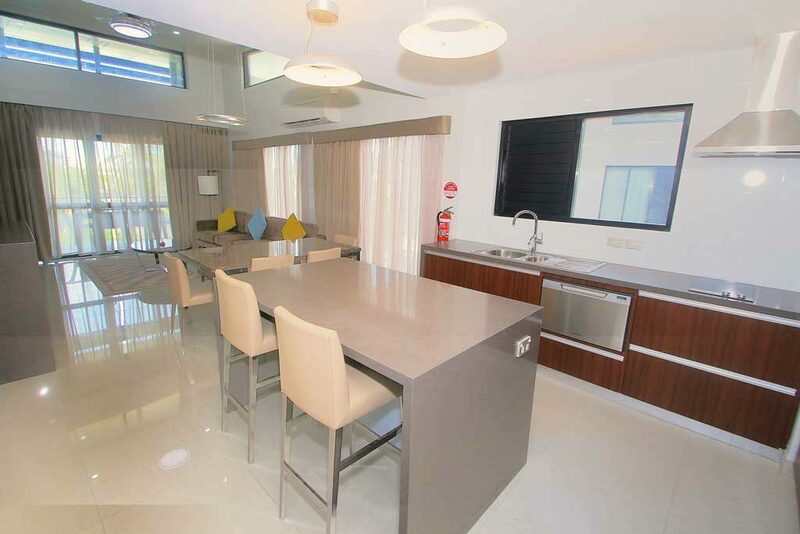 The two and three bedroom luxury villas are complete with a fully-equipped kitchen to make you feel at home and make use of the offering at the shopping precinct in Denarau and the local markets. Whether you choose to spend your time more independently or make use of the five-star facilities available at the Sheraton Denarau Villas and the neighbouring Westin and Sheraton Resort, you’re sure to have a luxurious stay in the Sheraton Denarau Villas. Check the Sheraton Denarau Villas out! 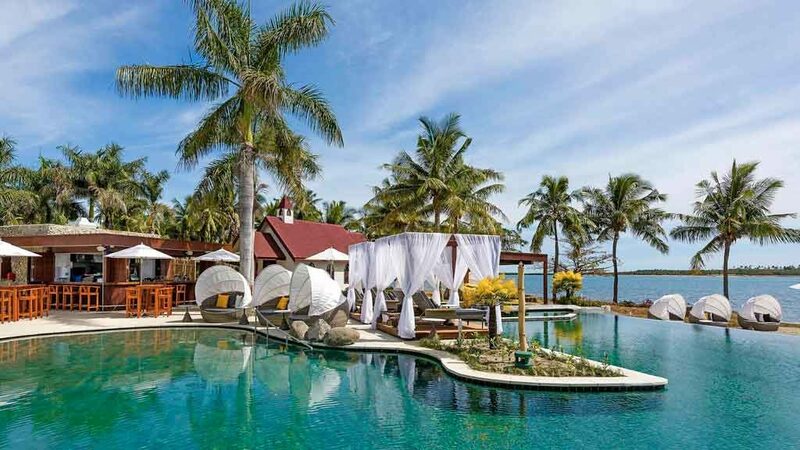 Boasting 2.5km (1.5 miles) of private beach, nine swimming pools, kids clubs and the KORO adult-only complexes, Hilton Fiji Beach Resort & Spa is a luxurious getaway catering to all types of traveller. The modern rooms welcome you with floor-to-ceiling windows to take in the views of the beachfront, pools and resort walkways lined with swaying palm trees. There’s an expansive range of poolside to oceanside bars and restaurants serving Fijian specialties to international cuisine. Check the Hilton Fiji Beach Resort out! 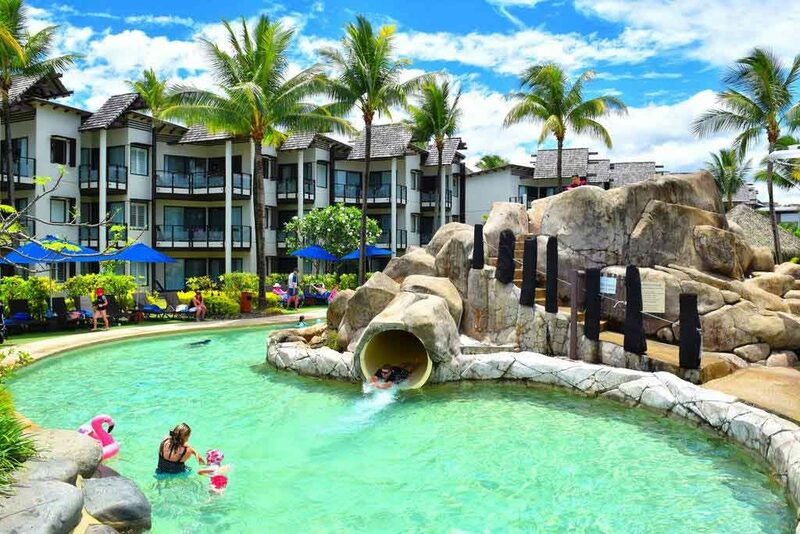 Enjoy the best of both worlds with luxury one, two and three-bedroom apartments in a resort-style setting at the Wyndham Resort Denarau Island. Families will enjoy the lagoon swimming pool and entertaining and educational kids club, while couples and adult groups looking to unwind from the pressures of everyday life have the the adults-only pool with a swim-up bar and spa areas. In between relaxing by the pool, pampering yourself at the spa and spending quality time with the family, you’ll sit down to delicious meals at their Mexican-themed restaurant. Looking for that resort experience without the 5-star rates? Consider staying in the nearby Club Fiji Resort. 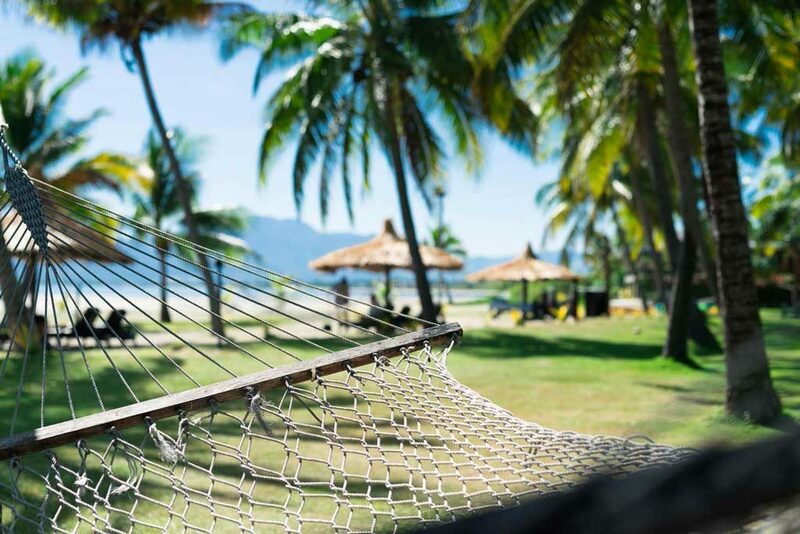 Only 4km (2.5 miles) away from Denarau, Club Fiji Resort provides a budget resort option on the beachfront with hammocks under palm trees, outdoor spa areas, an outdoor pool and access to a wealth of land and water activities. The restaurant has themed nightly dinners from a barbecue on the beach to Mexican nights and more. Enjoy cultural shows, playing pool and relaxing with a cocktail or a Fiji beer at the bar. 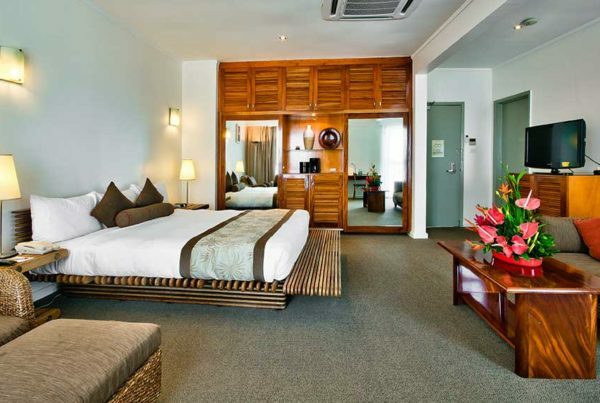 For more accommodation close to Denarau, check out our 10 Best Resorts in Nadi. Check Club Fiji Resort out! Hotels for Honeymoons and Weddings in Suva. A romantic getaway to Fiji may well take you and your loved one to Fiji's capital, Suva. Romantic Resorts in the Yasawa Islands. If you're looking for a beach wedding or natural beauty for a romantic getaway, then set your sights on the Yasawa Islands of Fiji. Adult-Only Accommodation in Suva (or the Next Best Thing...). It's true, Fiji is blessed with stunning adult-only resorts for romantic getaways, holidays with mates, or simply for some time out.